When David Allen plows fields or bales hay at his ranch on the Blanco River near Kyle, he’s following old footsteps: those of his great-grandfather, Ezekiel Edward Nance, a former Arkansas state treasurer who settled here in Hays County in 1853. But David is also making new tracks on the land where he grew up. 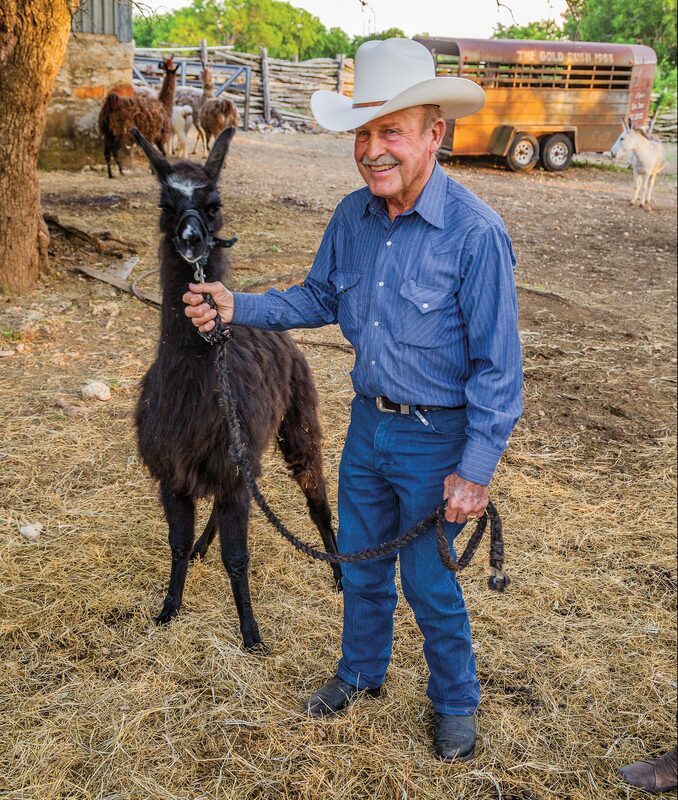 He and his wife, Shyrle Allen, have turned their working ranch into a country getaway with a pair of authentically restored historic lodges—and about a dozen llamas. “We were trying to diversify,” Shyrle explains of both the rentals and the woolly Andean pack animals living the good life at New Tracks Llama Ranch Bed & Breakfasts. An overnight stay in the 1840-era log cabin at New Tracks Llama Ranch Bed & Breakfasts is $125; the rock cottage, with a full kitchen, is $135 per night. Despite the newness in the name, time seems to stand still at New Tracks, which is how David and Shyrle prefer it. “I often wish I had grown up in the 1800s,” says 85-year-old David, who remembers riding into the small town of Kyle as a child and finding dirt streets and hitching racks for horses in front of the general stores. Heading west from Kyle, the narrow country lane that leads back to New Tracks passes fields of bluebonnets in the spring and live oaks that branch overhead year-round. Drivers have to stop and open a couple of gates. Glimpses of the Blanco sparkle through brushy woods. 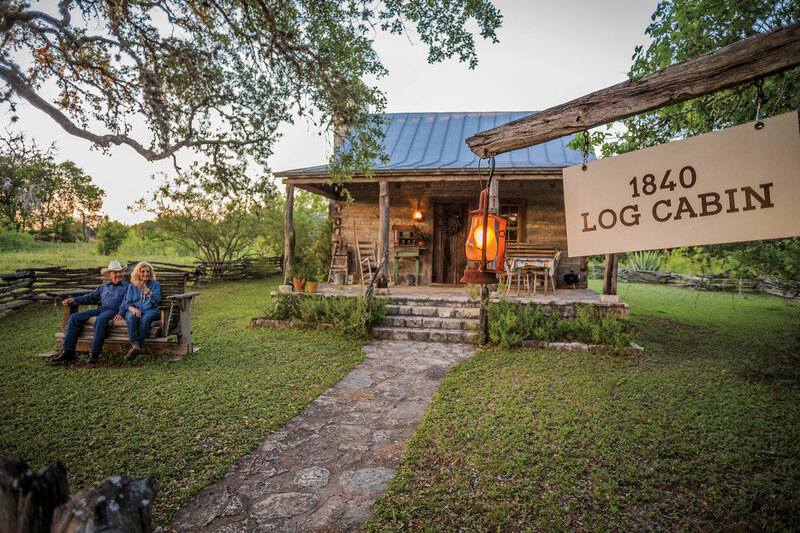 Upon arrival, guests make their way to a log cabin dating to 1840; the Allens moved the building to their property from La Grange about 15 years ago. Or they cozy up to a cottage built in the 1880s from hand-carved limestone that once formed a rock boundary around the historic ranch. Inside the rock cottage, an even older room once held spring water that kept bottles of milk cool. As for the exposed cedar logs and oak timber in the cottage’s upstairs bedroom, David repurposed them from an old barn the family constructed around 1860 with logs his great-grandfather cut on his river-powered sawmill. 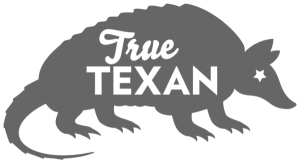 In addition to the sawmill, Nance also built and operated a three-story gristmill, a beef-packing facility, and later a cotton gin on the banks of the Blanco. “Ezekiel Nance was quite the entrepreneur,” David says. In the three decades before his death in 1885, Nance amassed 30,000 acres—nearly 47 square miles—along the Blanco, from present-day Kyle almost to the village of Wimberley. He was one of the region’s first major agricultural processors, employing so many people a community called Nance’s Mill grew up there, so he built a limestone chapel that doubled as a schoolhouse for the area’s children. Today, few signs of Nance’s thriving businesses remain along the river, and David inherited a fraction of his great-grandpa’s empire. Floods took care of the other riverside structures. This section of the Blanco is lower and slower than the parts that run through Blanco and Wimberley, however, and the river can go dry in drought. Many of New Tracks’ guests swim and canoe, but others prefer front-porch relaxation where sprawling oaks cast ample shade over the grassy lawns. The agricultural setting is certainly peaceful, if not necessarily quiet—the geese, rooster, and a noisy windmill make sure of that. Inquisitive miniature donkeys will probably stop by for a visit. As for the inscrutable llamas, they lounge around next to a very large and very old rock barn. A night in the log cabin would feel like sleeping in Texas’ frontier times, if not for the electricity and indoor plumbing. In the rock cottage, you can peruse a scrapbook filled with photos of llamas the Allens have owned over the years, along with snapshots of David judging contests of the camelids. Most of the long-necked pets have monikers like Knickers and Cinnamon, but you can’t help but root for an award-winning llama with a plain old name like George Moore. At New Tracks last spring, the llamas were still wearing their fuzzy winter coats, and a snowy white baby, or cria, watched cautiously from behind its placid mother. It was just 1 month old and would soon join the other llamas and their owners making new tracks next to the Blanco River. 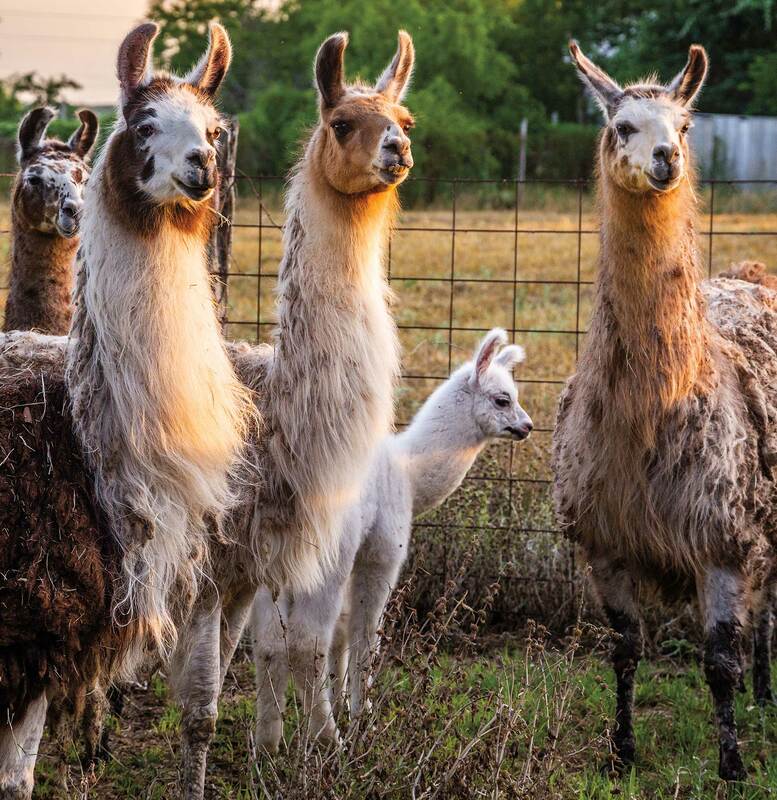 The Allens say raising llamas and renting out guest homes, among other efforts to build more diverse streams of revenue, are all about securing the historical and agricultural inheritance of family land situated in the midst of the Austin suburbs. Shyrle describes New Tracks as “the eye of the urban storm,” a place where city sprawl gives way to the sweep of a planted field, a bend in the river, and farm architecture Ezekiel Nance and his descendants built to last. Their ancestors might have even loved the llamas.